Rotherham boss Paul Warne was basking in a "crucial" win over Millwall in the Championship. 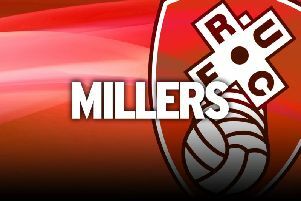 The Millers won their second game of the season at a drenched AESSEAL New York Stadium thanks to Sean Raggett's header in the first half. It ended the week on a high, following a midweek home defeat to Hull, and moved the Millers up to 15th after five games. Warne said: "I thought it was a real football game in Yorkshire. The weather has changed it feels like the football season is finally here. "If you are a neutral you would think it's a good game, both games are trying to win. "Both teams are good on set-pieces, I thought it was a real enjoyable game. It would have been more enjoyable if we'd have scored a second goal but I am really proud of the team, we have had pockets of spells in games where we have done well but there has always been an error to kill us. "The lads have done everything for us to get the win against a really good side. For us to get a win and not to lose two home games in a row was crucial." Rotherham's afternoon could have been more comfortable if Michael Smith had scored a golden chance in the second half, while Ryan Williams and Ryan Manning also went close. Millwall had chances, with Tom Elliott and Jed Wallace having the best of them, but boss Neil Harris was left to rue another disappointing visit to South Yorkshire after they were beaten at Sheffield Wednesday in midweek. Harris does not believe his side deserved to lose this one, but accepts his side cannot keep gifting sides goals. "I am frustrated, Rotherham did nowhere near enough to win the game against us," he said. "That's twice in five days that we have thrown points away. "When you play against Rotherham you know you have got to be strong from dead-ball deliveries and be organised and for the majority of it we were. "